The digital industry is booming in Scotland, with our small country becoming a world-leader in pushing technological boundaries. Since 2008, the Herald has been recognising and celebrating the most innovative, creative and commercially successful digital work in Scotland with the annual Scottish Digital Business Awards. Every year Scotland’s finest digital talent, companies and campaigns are honoured at a prestigious ceremony in Glasgow, where this year, for the first time, we were honoured to be finalists in the ‘business to business’ category! The ‘business to business’ award is given to the organisation that can “best demonstrate the effective implementation of digital platforms and tools in a business capacity”, with judges looking for evidence of “how the technique was adopted and has delivered consistent results in unpredictable market conditions”. At freetobook we constantly strive to deliver cutting edge technology to help independent accommodation providers thrive in their business – and we think we’ve been pretty successful so far! But we were up against some tough competition from Digital Parade, The Digital Age and xDesign, so we arrived at the awards night quietly confident and optimistic, but also thrilled just to be finalists in such hotly contested category. The freetobook team got our glad rags on (not a common occurrence!) and joined more than 250 other guests from the Scottish digital sector at the Radisson Blu hotel for a champagne reception, dinner and (finally!) awards. The drinks were great, the food delicious, and then it was time for the results! Our category was first up, and to say we had butterflies is an understatement! We were absolutely delighted, and the freetobook team were loudly celebrating as our co-founders Iain and Craig went up to accept the award. The rest of the night was a bit of blur for some of the team (not everyone, Iain had to fly to Isle of Wight in the morning for a Workshop! ), but there were some excellent speeches (Michael Docherty from Skyscanner was particularly good), and it was really inspiring to hear about so many different kinds of companies thriving in the Scottish digital sector; we were honoured to be a part of the event amongst such talented company, and thrilled to win our category! We’re a family company, and the values and business style that come from that are key to our business and success. But so is the technology that we bring to the table. 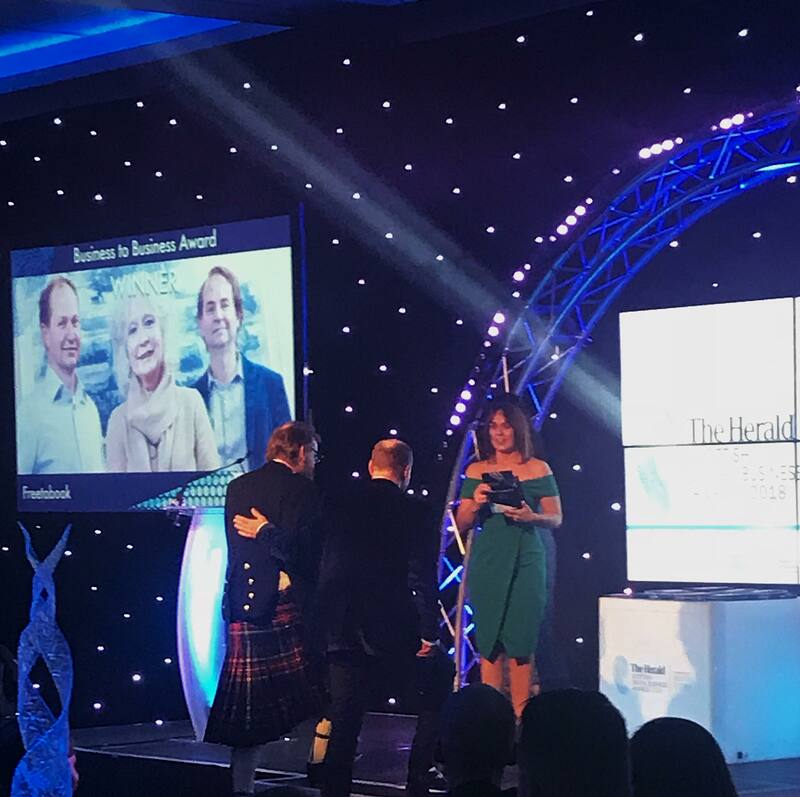 At freetobook we’re constantly innovating and updating our system, connecting to new channels and delivering new services – this is our passion, and we’re thrilled that the digital business technology we provide to our freetobookers has been recognised at the Scottish Digital Business Awards. Huge thank you to all our freetobookers for your support, well-wishes and congratulations – it honestly means the world to us! Big Congratulations to everyone at Freetobook on your Business to Business Award. Truly well deserved. Having a great team backing up our b&b business for the past three years has been such a help and enjoyable experience which we know will carry on and on. Congratulations Iain and craig and the rest of the team at freetobook you provide a fantastic service and the award was long overdo. Congratulations to all at freetobook, well deserved!! Congratulations, Iain and Craig and all the team! This is our first year with Free to Book and we are delighted with its ease of use, attention to detail, Stripe Plus, and online and telephone help. Actually, so far haven’t found anything we don’t like. Thank you so very much. Well done! We all knew you were winners, I’m so glad the world can see it as well. Helping non-tech’s like me to jump into the 21st century and so build our business, this would not have happened without your guidance, vision, patience and help in our early days. Congrats from Honeypot Crail, delighted to be a freetobooker. Super and well deserved result for a great product and excellent support! It’s been a treat being a freetobooker for almost 5 years. Well done, Iain and Craig! Your reward is totally deserved. Thank you for all your help and support in our years as Freetobookers, there simply isn’t a better, fairer system available. Well done and well deserved everyone at Freetobook. Keep doing what you are doing and many more awards will come your way. Freetobook is a great asset to our B&B and is so easy to use. Congrats from Hostel1W from Croatia, well deserved!!. A huge CONGRATULATIONS!!! You do a great job! I really mean it when I say you give a great service to businesses like mine, a family run B&B in Madrid! You not only provide a great solution, but also great service and very competitive prices, which is really important for small companies! A big thank you from Artistic B&B in Madrid!